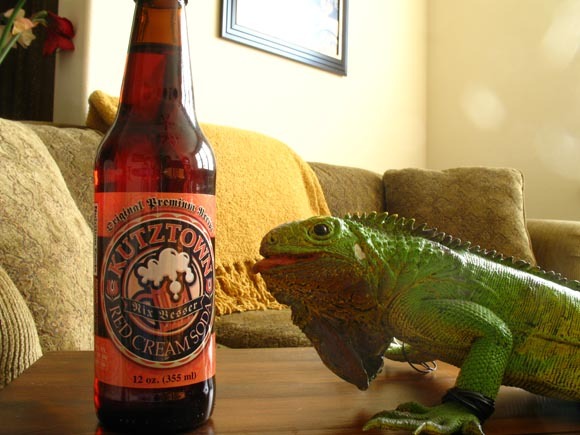 Mike used to be the one that reviewed Kutztown beverages. Sigh, I remember Mike. Anywho, he’s unavailable for this review so I guess the boy from Texas will have to review this northern delicacy of Kutztown Red Cream Soda. As I’m sure we’ve mentioned before, Kutztown is indeed a town… in Pennsylvania. It’s made at the Kutztown Soda Works, which was established in 1851. The “go ahead and buy this” sentence on the back of the bottle reads as such. Let’s avoid the obvious jokes that we might think of using “nutzin’ around” and just agree that they were using their name as a verb. I don’t understand the last part of the paragraph, “Drink ‘til it’s all!”. Maybe it’s some sort of Pennsylvanian colloquialism. So if any of you could please explain this to me that’d be great. Anywho, this is a sugar sweetened soda and I’m tired of not drinking it so we’re going to move on to that portion of the review. Ah, the sweet smell of red cream soda. It reminds me of a day my father and I wandered through Leonard’s Grocery Store and he picked up a bottle for the family movie night. Of course he picked up the generic two liter bottle of red cream soda, but I still had no idea what it might taste like at that stop in my life. The memory scent I get from this, which is much like a normal cream soda with a little more tang, will hopefully not sway me in a positive direction based on nostalgia alone. While I wouldn’t call it velvety smooth it still has a nice mouth feel. Kutztown Red Cream Soda has a very soft carbonation feel, almost like having a tiny kitten snuggle down upon your taste buds. That description should really go at the end of this review as it’s the final sensation your mouth experiences when your sip of soda is complete. I guess I should start with the negatives, but it’s a bit too late for that so here’s the point where I get to it eventually. Initially the taste isn’t what I’d associate with a smooth cream soda, but it’s only slightly off putting and for only a split second of the drink experience. Another thing is that the cream soda flavor isn’t all that rich, but it still might get the job done for most. My mind keeps going back to the words “velvety smooth” and my tongue keeps searching for said texture with no luck. I think if the vanilla level was raised just a bit they’d have quite the beverage here. As it stands now they have an above average red cream soda with a unique mouth feel. Of course this is something they should be proud of, but I bet with just a tweak more it could be outstanding. I do like the fact that the flavor doesn’t hang onto the walls of my mouth like many creams sodas would do. While I’m not sure if I just got done “nutzin’ around” (and I’m pretty sure I would know if I had been), the bottle is now empty and I’m satisfied with what I consumed. It's only so red because he's so green.